The Prophecy is joined by B-Complex for their “Encapsulation” excursion on Bad Taste. A thrilling yet diverse pill, not so easy to swallow. With a combination of likeminded production and positive outlook towards Drum and Bass as a whole, this duo has merged their sounds and created this sound wave of the future. 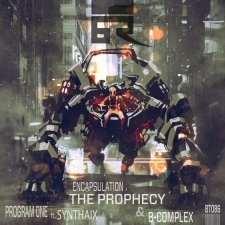 For a contrast The Prophecy combines with Synthaix and unlocks “Program One”. A collaboration based on the experimentation of sound.